What is PS, and What is it Used For? Polystyrene (PS) plastic is a naturally transparent thermoplastic that is available as both a typical solid plastic as well in the form of a rigid foam material. PS plastic is commonly used in a variety of consumer product applications and is also particularly useful for commercial packaging. Dow Chemical Company invented a proprietary process to make their trademarked and well-known polystyrene foam product “styrofoam” in 1941. The material is somewhat controversial amongst environmental groups because it is slow to biodegrade and is increasingly present as outdoor litter (particularly in the form of foam floating in waterways and the ocean). The solid plastic form of polystyrene is commonly used in medical device applications like test tubes or petri dishes, or in day-to-day items like the housing on your smoke detectors, the case you used to buy your CDs in, and frequently as a container for foods like yogurt or the red “solo” cup you drink from at a tailgate and/or when you’re losing in a game of beer-pong. The foam form of polystyrene is used most often as a packing material. You have probably unpacked a custom styrofoam housing if you’ve ever bought a new television, or a significant piece of new equipment like a Miter saw. Similarly, you’re probably familiar with styrofoam packing “peanuts” used as filler for miscellaneous small items being shipped. Styrofoam is also used for “to-go” containers and disposable tableware from many restaurants. What are the Characteristics of Polystyrene? 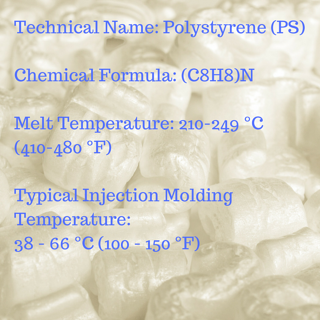 Now that we know what it is used for, let’s examine some of the key properties of Polystyrene. Polystyrene is typically (but not always) a homopolymer meaning that it is composed only of the monomer styrene in combination with itself. Depending on the type of PS it could be classified as a “thermoplastic” or a “thermoset” material. The name has to do with the way the plastic responds to heat. Thermoplastic materials become fully liquid at their melting point (210-249 degrees Celsius in the case of Polystyrene), but they begin to flow at their glass transition point (100 degress Celsius for PS). A major useful attribute about thermoplastics is that they can be heated to their melting point, cooled, and reheated again without significant degradation. Instead of burning, thermoplastics liquefy, which allows them to be easily injection molded and then subsequently recycled. Thermoset plastics, by contrast, will not reliquify once they are “set” in solid form. By contrast, thermoset plastics can only be heated once (typically during the injection molding process). The first heating causes thermoset materials to set (similar to a 2-part epoxy) resulting in a chemical change that cannot be reversed. If you tried to heat a thermoset plastic to a high temperature a second time it would simply burn. This characteristic makes thermoset materials poor candidates for recycling. Why is Polystyrene used so often? Polystyrene is most uniquely useful for its application as a foam. It is the runaway leader in the packaging industry but it also has a wide range of uses as a traditional plastic. At Creative Mechanisms, we have used Polystyrene in a number of applications across a range of industries. For many years Polystyrene, or as it is often referred to as just Styrene, was used as the go-to prototyping material - basically for the same reasons we now use ABS. It's inexpensive, readily available, white in color, and it glues, sands, cuts, and paints well. The “S” in ABS is Styrene. A lot of older engineers and designers who have been in the industry for a while will ask for a Styrene model when they’re looking for a quick-down-and-dirty prototype. We still have a lot of sheets of Styrene in the shop at Creative Mechanisms. We will use them to make quick test models, paint samples, vacuum formed or thermoformed prototypes, or large models that can be created with flat sheets. We have also seen PS used as a sort-of living hinge material (typically polypropylene fits best into living hinge applications). There are clear disposable PS containers (e.g. a hot dog container from WaWa or your neighborhood convenience store for those living outside the Northeast) that function like a clamshell with a hinge in the middle. The hinge in this case is a little different than your traditional PP living hinge. Typically the PS hinge is more of a series of bends that allow the clamshell to flex and open up. Whether it is technically a living hinge or not, it still works very well and can be easily thermoformed. What Are The Different Types of Polystyrene? Three major types of polystyrene include polystyrene foam, regular polystyrene plastic, and polystyrene film. Amongst the different types of foam are expanded polystyrene (EPS) and extruded polystyrene (XPS). EPS includes the most well-known and common types of polystyrene to include styrofoam and packing peanuts. XPS is a higher density foam typically used in applications like architectural building models. Some types of polystyrene plastic are copolymers. Oftentimes homopolymer PS is fairly brittle and can be made more impact resistant if combined with other materials (known in this form as the copolymer High Impact Polystyrene, or HIPS). Polystyrene film can also be vacuum formed and used in packaging applications. Films can be stretched into oriented polystyrene (OPS) that is cheaper to produce (albeit more brittle) than alternatives like PP. Polystyrene, like other plastics, starts with the distillation of hydrocarbon fuels into lighter groups called “fractions” some of which are combined with other catalysts to produce plastics (in the case of polystyrene through the process of polymerization). You can read about the process in more depth here. Polystyrene foam is produced using “blowing agents” that expand and cause the foam to form in a state such that it is principally composed of trapped air. Polystyrene is available in sheet stock, rod stock, and in various shapes. It is a great candidate for subtractive machining processes on a CNC machine. Colors are usually limited to clear, white, and black although colors can be added and it is an excellent candidate for external painting. We have heard of firms using High Impact Polystyrene (HIPS) as a filler material for 3D printing (available in filament form) although we do not typically use it ourselves. General Purpose Polystyrene (GPPS) and High Impact Polystyrene (HIPS) are probably the most commonly used PS resins for injection molding. GPPS is clear, but brittle (think of a CD jewel case) while HIPS is opaque and much less brittle. Generally speaking polystyrene is non-toxic and odorless. It is a predominant plastic in the food packaging industry. While that might lead you to believe it is entirely safe, some studies have reported “potential health impacts from polystyrene foam food packaging associated with its production, and with the leaching of some of its chemical components into food and drink.” Note: Polystyrene is flammable and similar to other organic compounds, it emits carbon dioxide and water when it is burned. What are the Disadvantages of Polystyrene? Polystyrene is very inert meaning that it doesn’t react particularly well with either acidic or basic solutions. This characteristic causes polystyrene to last a long time in the natural environment which poses a litter hazard as the material is typically thrown away after an extremely short useful lifespan. Note: polystyrene does dissolve fairly rapidly when put into contact with chlorinated or other hydrocarbon substances. What are the properties of PS?